I’m participating in a Book Bee with a few members of the Houston Modern Quilt Guilt. 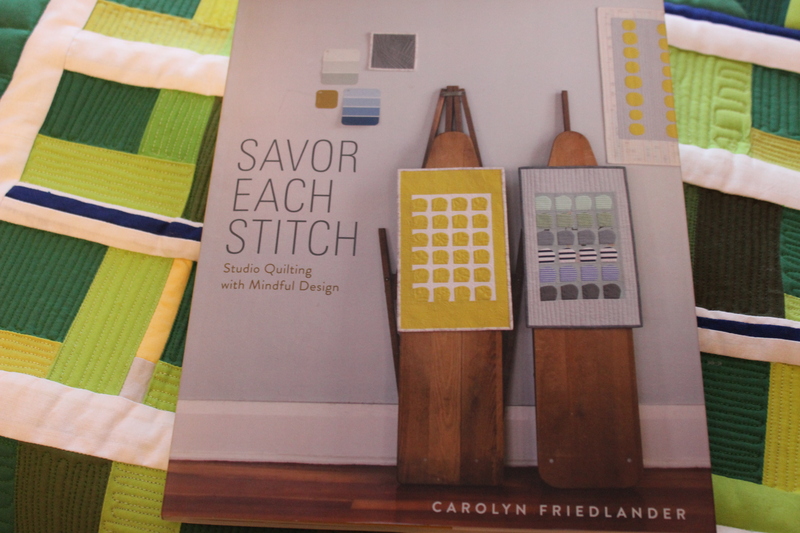 We’re using Carolyn Friedlander’s book, Savor Each Stitch. I learned of this group from the blog, ModQuiltMom. They meet in Houston, Texas the first Saturday every other month, and they were gracious to allow me to follow along using a Google community page. Our goal: to share pictures, links and thoughts about our book bee. One evening while we were painting the field, one of the players and his mother drove by the school and his mother suggested her son volunteer to help us. After speaking with my husband, he came back to his mother and said, “No. He doesn’t need help. It’s ‘Date Night. '” The player’s mother enjoyed telling us this story. That’s just downright funny and the perfect name for this quilt. 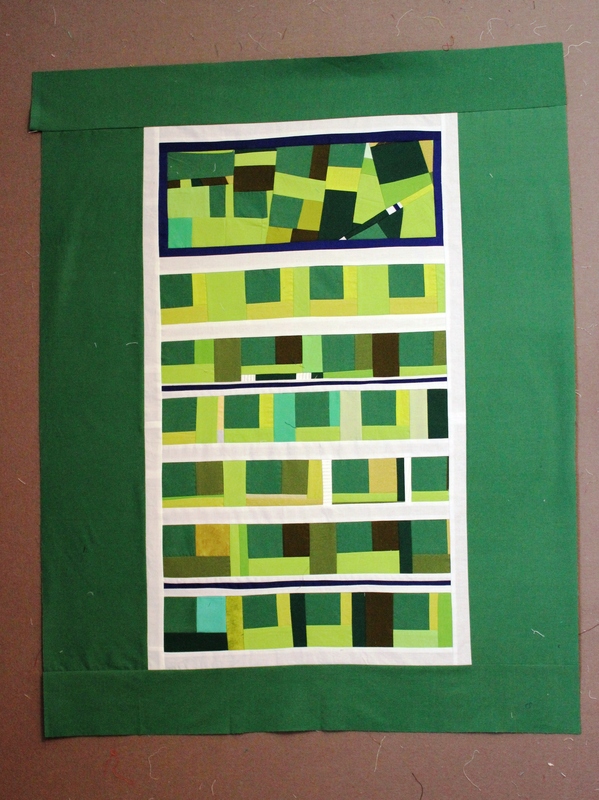 From there, I started sewing from my “green” scrap bin, except I had about a half yard of kelly green. My husband suggested the “end zone” needed blue accents. I like how the “end zone” is very liberated and the rest of the field is linear. I used high loft batting to give the grass some texture. I’m debating if I should quilt the white lines and if I should quilt in the name of the quilt on the front rather than on a label on the back. I’m going to let it stew for awhile and when I come back to this quilt I should know how I feel about doing that. I’m enjoying this Book Bee and seeing what the other quilters are doing. The next chapter is Contrast. Initially I wanted to make a small quilt for each chapter in the book, but I’ve learned making Date Night that all the elements of thoughtful design were used in making this quilt. My desire to make multiple quilts was unrealistic. I always have lots of ideas and not enough time to turn those ideas into actual quilts. 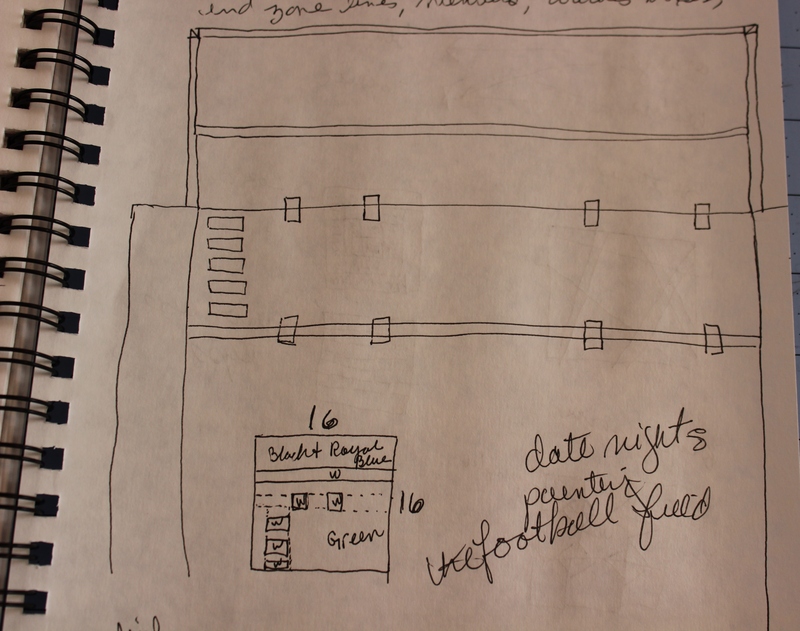 CF writes in her book about sketching ideas over and over until you find the essence of your idea. I feel I rush through that process and taking the time to get out the “stakes, string and measuring tape” should improve my design process. At the same time I like just fiddling with fabric and seeing what happens when there is no plan. It’s a tough balance. 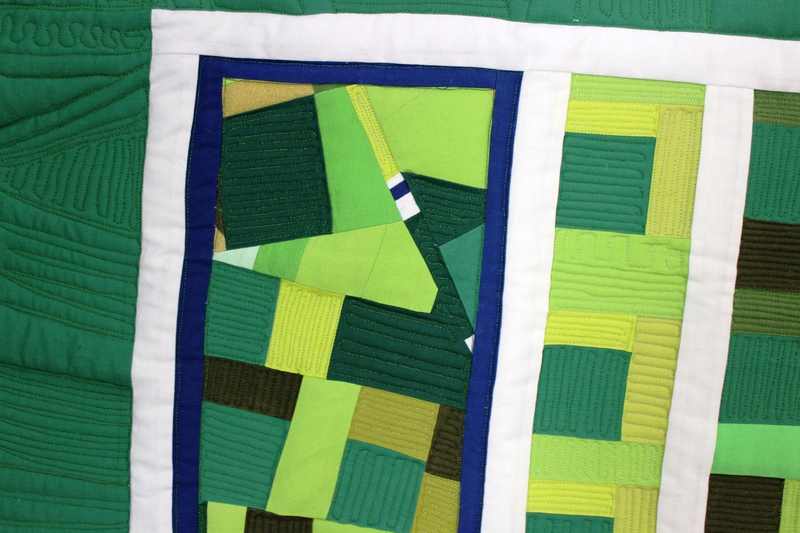 There are no rules in making a modern quilt, but just in case. Five Things you should know. 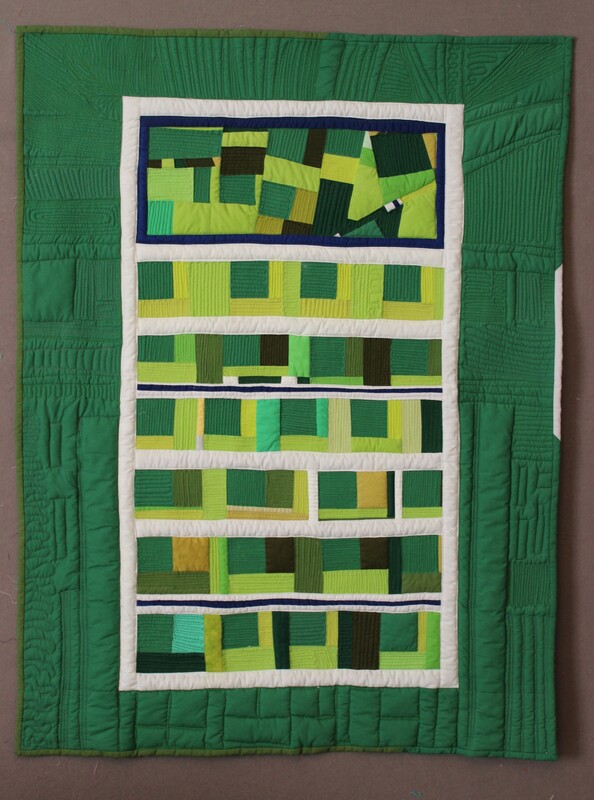 I like your quilt and your description of CF’s book–gotta have a look at the book. I’m a big fan. I highly recommend. Wanda, what are the dimensions of your quilt, love this. Your quilting is perfect! It’s 30 by 38 inches. So glad it made it! Wanda, I found you and your blog! I really love how experimental you work and that you’re open to try something new! Carolyn Friedlander is an architect like myself, ultimately I love her fabrics and I’m curious about her book. Thanks for sharing! Thanks, Daniela. I’m glad you found my blog. A lovely quilt, and lovely ideas. Many thanks for the post! It is wonderful when one small story for one quilter to another permanently impacts the second person for the better. I think you have done with sharing your ability to look so closely at the small encounters in daily life. Thanks. 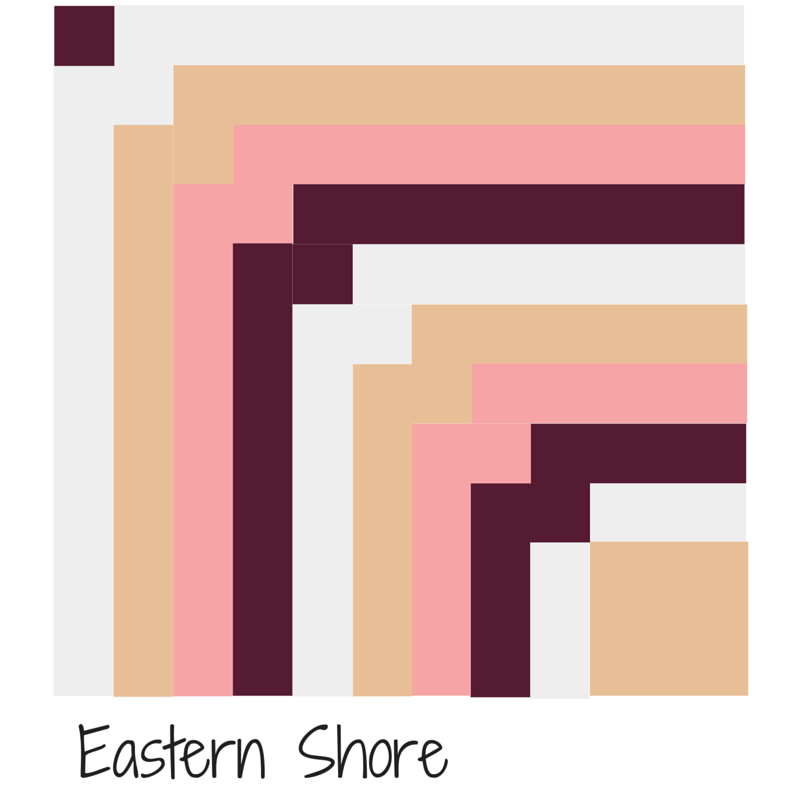 I’ve been trying to design quilts which have a personal story.